Although we all know that we can resolve to develop new habits at any time, as one year comes to a close and the next begins, people from all corners of the world are taking stock of last year and deciding how they want to make 2018 different. Although many create New Year's resolutions, few stick to them. Though exact figures vary, Business Insider claims that 80% of resolutions fail by February, and according to Forbes, only 8% of people stick to their goal for the entire year. When your resolutions are tied to your academic and professional goals, you can't afford to be another statistic. Discover why resolutions fail and learn how to make SMART goals regarding your studies. While many of the most common resolutions relate to health/fitness/wellness, for those who are crafting education-focused resolutions, there is significant overlap regarding what derails all resolutions regardless of their exact category. The single biggest reason why people fall off the wagon so quickly is that they get completely discouraged and entirely give up after the most minor slip up. Instead of seeing the value in incremental progress, most resolution-makers see their resolutions as all-or-nothing propositions and they get frustrated by not seeing immediate results. That means if you do indulge on New Year's Eve, it makes it difficult to kick off January 1st being true to your newly minted study schedule (or any other resolutions you came up with), and missing even one day significantly decreases the likelihood of continuing with that resolution. When it comes to the TOEFL, this means that students who vow to write an independent essay every day are setting themselves up for a major disappointment when after the holidays they are so tired from celebrating that they can't bring themselves to turn on their computer come January 1st. For those that overcome this barrier, you still may run into the problem of feeling disappointment when after a week of sticking to your goal of reading a TOEFL passage each day, your TOEFL score has not yet increased by 20 points. While the technique of reflecting before coming up with resolutions is by no means revolutionary, it is a necessary part of the process, and one that too many people gloss over. Have you made resolutions in the past? Did you stick with them? Consider what motivates you and reconnect with your why-- the main reason you are doing something. Why are you taking the TOEFL? Why are you learning English? After you have your answer, post it in a visible spot that you will refer to regularly. This will at least help you stay a bit more motivated when you are tempted to spend some time on Facebook rather than compose a TOEFL practice essay. After contemplating your big reason why, break it down into smaller components in order to create specific and actionable goals. While the SMART method of goal setting is not unique to education, it is an extremely valuable tool for reshaping goals to make them more likely to come to fruition. SMART is an acronym which stands for Specific, Measurable, Actionable/Attainable, Relevant/Realistic, and Time-bound. By decreasing the number of resolutions you make, creating a realistic timeline, and getting specific about what you want to learn and why, you can help create resolutions that you can stick to. When it comes to the TOEFL, making sure that your goal is attainable means starting with a practice test. How can you know what is attainable without knowing your starting place? 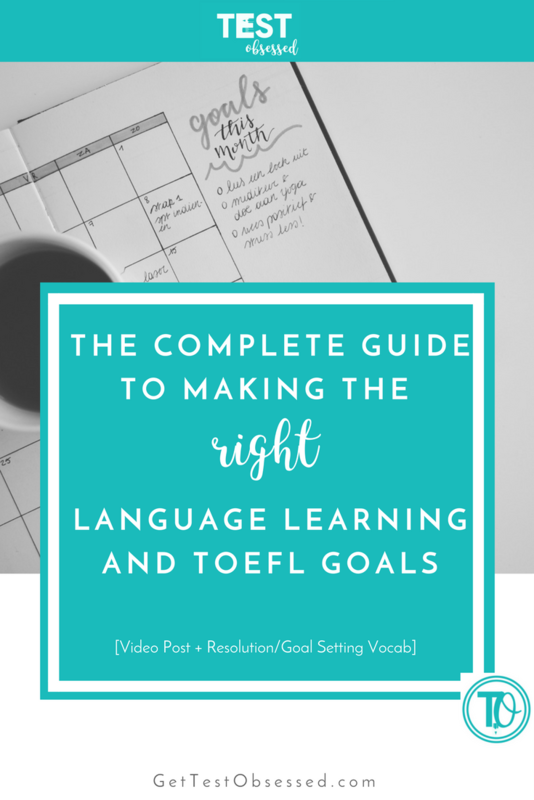 When it comes to being realistic, make sure each of your language learning goals relates back to something applicable to the TOEFL or university level interactions. While learning for learning's sake is nice, it doesn't make for reasonable goal setting. In Psychology Today's "5 Alternatives to Traditional New Year's Resolutions," psychotherapist Amy Morin advocates picking one new habit to focus on per month. This is such great advice and can be easily applied to the TOEFL. Because the test is such a big undertaking, focusing on learning just one section for an entire month (while completing regular practice tests) can help you see more immediate progress. It will also allow you the time you need to focus on each of the styles of questions. In the speaking section, for example, there 6 different styles of questions. By focusing on just the speaking portion of the exam, you can allocate Mondays to look at Independent Speaking question 1 strategies, Tuesdays for Speaking question 2, through Saturdays for Speaking question 6 and then review and practice problems on Sundays. By repeating this cycle 4 times, you can master concepts before moving on. If you do lapse, don't give up. In fact, go in knowing that this will happen and that it is okay. Write down motivation to keep going each and every week in your calendar. Skipping one day's study session isn't the end of the world nor will it necessarily have an impact on your overall score. Were you overly ambitious with the plan you set forth? If you realize that your schedule is untenable, revise it. In business, entrepreneurs are taught to see everything like an experiment. The same should be said of students. Because students are not one size fits all, your study plan should not be either. Factor in your time constraints, for example, right from the beginning, but know that you may need to make changes as you go. Modifying your study schedule does not mean you failed. Instead, it means you have a better understanding of yourself and your needs. The most common resolution I hear from students is I want to improve my English. Like the other resolutions on this list, this sentiment comes from a great place. The motivation to increase your skills is admirable, but the problem is that this resolution is far too vague. How will you know that you have achieved your goal? The original way it is phrased makes it overly open-ended. Instead, use the SMART system in order to rewrite the goal to what you need it to be. Take inventory regarding the resources at your disposal. What will you use to "improve" your English? Will you use Quizlet to learn vocabulary words, listen to Ted Talks regularly, or follow me and other language teachers on Instagram? Will you enroll in a class or get a tutor? What do you have, how do you best learn, where are you starting from, and where do you need to get to? Whether you are taking the TOEFL or not, defining the word improve is a must in order to come up with a plan of attack. Though there is some debate over the exact figure, estimates put the number of words in the English language at around 1 million and counting. That doesn't account for words with multiple meanings or the variation in meaning that one can get from combining different words into different phrases or different tones. This means that without focus, the idea of learning new vocabulary words seems futile. Do you want to learn slang to better fit in with those you work with or attend classes with? Do you want to learn academic vocabulary that is more appropriate for writing papers? Do you want to focus on phrasal verbs to have better daily social interactions? Do you want to be familiar with a list of the most common words tested on the TOEFL, SAT, or GRE? Knowing the category of words you want to learn about will help give you a direction and knowing how to use them will help you design practice that makes you implement the new term, helping with vocabulary retention. I highly recommend learning vocabulary words by groups and learning them at times of the year when they are most likely to be needed will help you find situations to apply those new words and phrases to. Watch the video for 12 words and phrases related to resolutions, plans, and goals. While it isn't always at the beginning of the year, this is a goal I hear students set regularly. As soon as I hear it, I know it is only a matter of time until this plan unravels. Because it is more specific than the previous goal, students feel like they are setting a SMART goal; however, they are forgetting about the other words in the acronym (measurable, attainable, relevant, time-bound). For how long are you going to learn 100 new words a day? What is the purpose of the new words? While it is measurable, the real problem centers on being attainable: it is extremely difficult to truly learn 100 new words a day. Students with lofty goals like this often forget to build in time for review. By the end of the week, if I gave them a quiz with 10 words selected at random from the 700 they attempted to learn, odds are, they will not be able to pass. Come up with a more reasonable number of new vocabulary words (5 new words a day and then review them regularly and cumulatively). Do not skip the review when devising your plan. The good news about this goal is that it easily adapts to the SMART model. Because the TOEFL is a language proficiency test, the exam itself provides measurable intel as to how you have done with this goal. However, the Achilles heel to this particular resolution is that students often forget to make it time sensitive. Because students realize that it is often a long process, they simply accept not picking a date to take the test. Instead, they just say they will study, they will take the test, they will get into college. Take a practice test and then pick a date. This will help keep you on the right track. Of course, once you've selected the end point, be sure to select your goal score and divide the exam into smaller parts to hit milestone goals and to create a focus for each individual study session you schedule. A common variation of this is I will study for 3 hours every day. While the amount of time is specific, there isn't actually a set, desired outcome. Although you can certainly see if you have sat down to study for that length of time, how do you know if you've made progress? Every study session needs to have its own sub-goal. Have you ever stopped to define what it means to be fluent to you? The definition can be a little hazier than you might initially think. Does this mean that you don't make mistakes when speaking in English? Well, even native speakers make mistakes, so this doesn't seem to be relevant, realistic, or achievable. Instead, focus on one specific skill you identify with being fluent, like clearer pronunciation, and then break this into a more specific and measurable skill. For example, by the end of the month, I want to use reductions to sound more natural in casual conversation. Avoid the make-it-and-break-it pattern that befalls so many by creating resolutions the right way. Get rid of the vague, open-ended resolutions and create more specific, more measurable ones that you can see progress on to keep your motivation high. Still need some more direction? Know exactly what you should write about every day for the next 30 days with this free printable. Thank you! Click here for your essay prompts, and be sure to check your email for even more TOEFL tips and tricks. Did you set a New Year's resolution related to language learning or taking the TOEFL? Did you stick with it? Tell us about it in a comment below.